This course assumes some familiarity with Adobe Dreamweaver CS6. 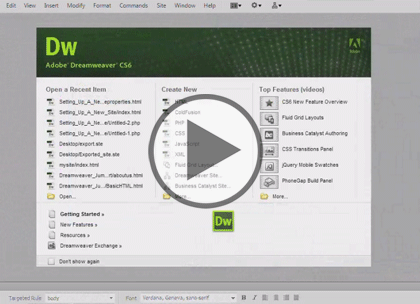 This course is part of an eight part learning series; Dreamweaver CS6: Intro, Sites and Properties; Dreamweaver CS6: Format, Images and Styles; Dreamweaver CS6: Container and AP Divs; Dreamweaver CS6: Float, Nav Bar and CSS3; Dreamweaver CS6: Tables, Cells and Workflow; Dreamweaver CS6: Flash A/V, Library and Code; Dreamweaver CS6: Web Forms and Spry Framework; and Dreamweaver CS6: Mobile, Grid & Managing. Please be sure to view the courses in order if you are new to the material.